Two recent studies have shown that “cheap talk” is an effective means of eliminating positive hypothetical bias in experimental and field-auction settings. We further investigate the ability of cheap talk to mitigate positive hypothetical bias in a contingent-valuation phone survey administered to over 4,000 households. Positive hypothetical bias is detected in our data by contrasting revealed and stated preference information. However, a short, neutral cheap-talk script appears to exacerbate rather than mitigate the bias. Based on this and mixed evidence from earlier studies, we suggest caution in using cheap talk as an ex ante control for hypothetical bias. Aadland, David M., and Arthur J. Caplan. 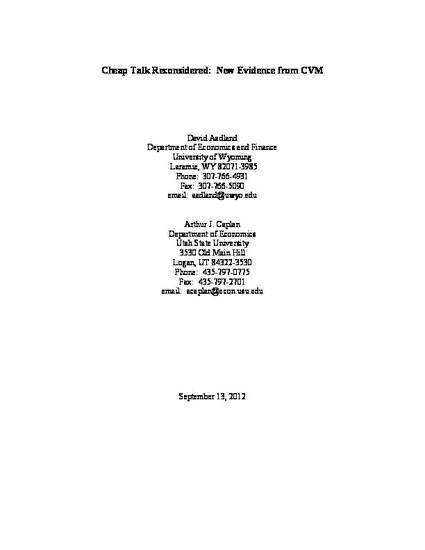 (2006) "Cheap Talk Reconsidered: New Evidence from CVM." Journal of Economic Behavior and Organization, 60(4), 562-578.